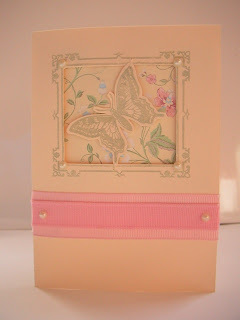 For this card I stamped the frame and cut out the centre, I stamped the butterfly on a piece of card and cut it out. To attach the butterfly to the frame I made holes using a pin in the frame and corners of the butterfly and sewed it in place by hand. I cut out a square of floral print paper (Laura Ashley) and used some foam pads to stick it behind the frame. I added some half pearls to the corners of the frame. To finish I added two different tones and widths of pink grosgrain ribbon below the frame and two more half pearls. The hardest part was sewing the butterfly to the frame, a little tricky. Stamps were from Anna Griffin In the Garden.